Bicycle and paddlesport dealers can now hop on over to Persons-Majestic for the latest shipment of the brand new Knog green Frog light. The green light, when combined with the red and white Knog Frogs, can be used as running lights on kayaks and racing sculls. The lights will last for up to 360 continuous hours on one set of coin cell batteries and feature both a steady and flashing mode. Plus, they can be clipped to many parts of a bicycle, kayak or racing skull. Weight is a miniscule 12 grams. 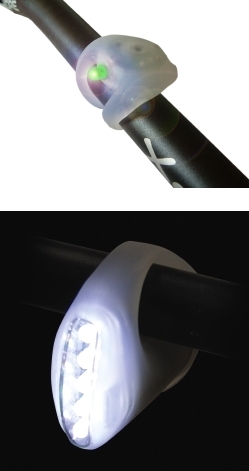 For cyclists, the white Knog Toad handlebar mount light boasts five Nichia Ultra-Bright LED lights, and like all Knog lights, its rubber silicone body not only offers moisture protection but also a unique way of attaching the light to a bicycle. The Toad runs on three AAA batteries and has a run time of approximately 15 hours for the steady light and 50 hours in the flashing mode. The light is available in bright white only. "Consumers and paddlesport dealers have been asking for a Knog green Frog for some time now, and finally Knog has responded," says Charlie Persons, president of Persons-Majestic. "And cyclists will be amazed at the brightness of the new Frog Toad light with Nichia LEDs." All Knog lights come with batteries included. Both the Knog Frog and Knog Toad are available from Persons-Majestic. For a catalog and new price list, dealers should contact Persons-Majestic at 1-800-772-2453 or e-mail permaco@aol.com.